I warmly welcome you to the Chinese Embassy. Today’s event is sponsored by the British Red Cross and supported by the Chinese embassy. We are honored to support this event because this year marks the 150th anniversary of the International Red Cross movement. One and a half centuries ago in 1863, the International Committee of Red Cross or ICRC was launched in Geneva. This was the initiative of Mr. Henry Dunant, who has since been regarded as the founding father of International Red Cross movement. In the past one and half centuries the ICRC, and its national societies, have provided immeasurable humanitarian assistance to those affected by conflicts, diseases and natural disasters around the world. The simple emblem of a red cross has become a beacon of compassion and hope. It has become a banner that unites people across borders to protect life and value health. It has become a clarion call for prompting peace and development. Here in the UK, the British Red Cross has a very proud record. Whenever a disease or natural disaster strikes, the British Red Cross is always the first to help. Just last week the worst storm in 26 years hit South England. It left many homes without power and caused severe transport disruptions. As is its custom, the British Red Cross was quick to move. They helped with search and rescue operations and provided relief materials. Their work greatly lessened the distress and sufferings of those affected. The British Red Cross also responds to natural disasters, diseases and conflicts outside Britain. It has been in action in Ethiopia, Syria, Zimbabwe and the Republic of South Sudan. Wherever it operates the British Red Cross is always found working hard to provide aid and improve the life of stricken people. In 2008 a powerful earthquake measured 8.0 on Richter scale struck China’s Sichuan province and caused colossal economic loss and heavy casualties. The Chinese people will not forget that, along with other national societies, the British Red Cross provided large quantities of humanitarian assistance both in cash and in kind. In particular, the British Red Cross sent a rescue team immediately after the earthquake. Through building hygiene and water facilities as well as training Chinese disaster relief workers, the British team played an important role in the post-disaster reconstruction of Sichuan. I would like to take this opportunity to sincerely thank the British Red Cross for helping the Chinese people in this way. I also wish to pay a great tribute to all of you, and those who have supported the International Red Cross movement. The Red Cross Society of China, or RCSC, also has a long history and an honorable tradition. Established in 1904 in Shanghai, the RCSC now has grown to 100,000 branches and a total of more than 30 million members as well as volunteers. 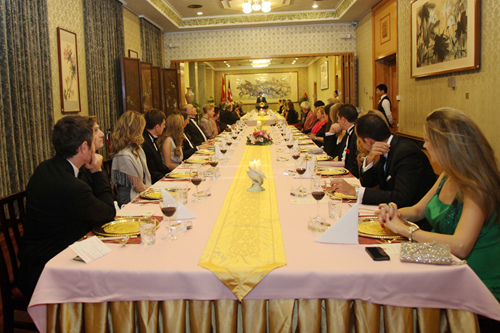 It has maintained close cooperation with the British Red Cross and many other national societies. I hope that through closer exchanges and cooperation the Red Cross societies of our two countries will create more touching stories and contribute to stronger China-UK relations. I also hope that more compassionate people will join the noble cause of the International Red Cross movement and help send care and help to every corner of the world. To the vigorous growth of the Red Cross movement! 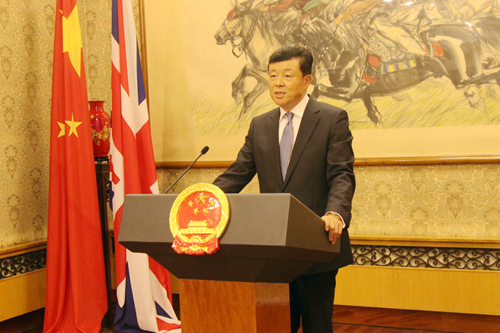 To the closer collaboration between Chinese and British Red Cross Societies!